Reel Talk Online: DVD Review: "Morning Glory"
"I'm not saying the word fluffy!" Rachel McAdams seems to be stuck in these underwhelming, girl-next-door roles that neither show her talent nor show any signs of escaping into another genre. And it's a real shame, because she's better than that. Even in those roles, she manages to stay charming and engaging throughout. Her last movie, Morning Glory, is no exception. McAdams stars as Becky Fuller, the 20-something producer prodigy whose latest assignment calls for her to resuscitate the dying morning TV Show "Daybreak" on the fictional station IBS (no relation to irritable bowel syndrome). Desperate for work, Becky joins the team amidst low-morale and doubts about her talent from the entire cast and crew. But even her near insufferable perkiness and enthusiasm can't propel the morale of her cranky hosts Colleen Peck (Diane Keaton) and Mike Pomeroy (Harrison Ford), who can't seem to stand each other. Mike, a veteran news anchor, is still sore that his career has come to covering small fry news tidbits. And Colleen is stuck with being the face of a failing show with a grumpy co-host. Meanwhile, Becky is juggling a demanding career with an impending romance, and not doing very well with either. But it's up to her to revive the show and find a way to jumpstart her personal life--in other words, try to find a way to have it all. Just like the fictional TV show, McAdams is desperately trying to save a movie whose heart flat-lined just moments after the opening credits faded off the screen. Her impossible cuteness couldn't save the movie either. For a movie that has a few heartfelt moments, it doesn't really grab at the heartstrings of the audience. But rather it flails about with no clear course as to where it's going and what its point is. 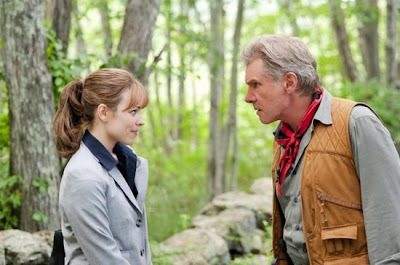 Ford, like his character, seems non-committal in the role and really phoned his performance in. Keaton's usual zany behavior is drastically cut down in a role that actually could have used some. Goodness knows the movie did. McAdams shouldn't have been the only one invested in the movie, though it seemed she was. Morning Glory is a lackluster knockoff to Devil Wears Prada, minus the heart, cleverness and fashion. It's just not a good time, as it claims to be. It's a bit of a mess and the mediocre script doesn't do the actors justice but I had a good time watching this. Quite stealthily, Rachel McAdams was really solid in her first comedic role. The movie had an old-fashioned, almost sit-com like feel which I found quite refreshing.